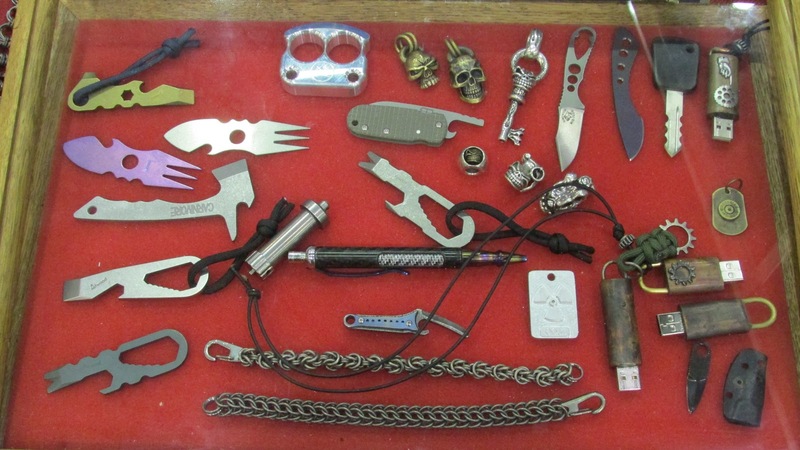 Fun little Items that would Give our airport TSA thugs wet dreams. Atlanta, GA-Whenever I can attend a gun or a knife show I go out of my way enjoy the experience. If I see something visual I will yank out my iPhone and shoot it. This was The Blade Show. Here are two items that qualified for this blog. One is a self-contained fire starting kit for survivalists and campers. Watch how quick you can start a fire without matches or that cheap and easy Bic butane lighter. The other is a diver’s knife designed for combat with hungry sharks. When you stab the shark the knife releases compressed C02 gas that creates massive traumatic havoc with the critter’s internal organs including freezing them. Of course if Jaws gets close enough to me I would expect to become his dinner in short order. If this knife were used against a human the massive resulting wound cavity would bring a major challenge for any forensic pathologist trying to figure just what caused the massive injury. Here are two videos showing these items.